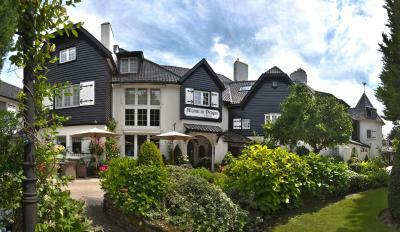 Lock in a great price for Hotel Manoir du Dragon – rated 9.1 by recent guests! Great breakfast! Great food, great drinks like super fresh orange juice in a phenomenal environment. We really liked the kind staff as well and the breakfast room itself was an experience. Top and a real recommendation,. Excellent déjeuner au niveau du choix et de la qualité. Salle de restaurant très agréable et le personnel également. Magnifique jardin et superbement entretenu. La politesse du personnel est parfaite . Excellente localisation, grande chambre avec sauna. The Manoir du Dragon is next to the Royal Zoute golf course, a 15-minute walk from Knokke-Heist's sandy beaches and the North Sea. This hotel has grounds with a terrace, and bike and car rental services. Wi-Fi and private parking are available free of charge. All of the air-conditioned rooms have a sitting area, a flat-screen TV and a balcony. The luxurious bathroom features a spa tub, slippers, a bathrobe and a hairdryer. A minibar and a kitchenette are provided as well. A wholesome breakfast buffet is served daily. Restaurants, bars and supermarkets are within walking distance of Hotel Manoir du Dragon. Guests can enjoy the coastal tram service, which runs along the entire Belgian coastline. 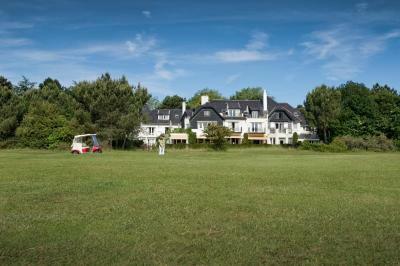 The Casino of Knokke is just over just over half a mile from the property. Knokke Train Station is half a mile from the hotel. Knokke is a great choice for travelers interested in luxury brand shopping, clothes shopping and shopping. When would you like to stay at Hotel Manoir du Dragon? This spacious room comes with a balcony or a terrace. It has a private bathroom with a bathtub or an Italian shower. Equipped with a bath or an Italian shower, this spacious room comes with a terrace with outdoor furniture and a view of the golf course. Equipped with a bath or an Italian shower, this suite consists of a living room and offers a terrace with outdoor furniture and a view. This twin/double room has a DVD player, bathrobe and cable TV. Overlooking the Royal Zoute golf course and surrounded by beautiful gardens, this charming manor offers you unequalled comfort, in its 17 individually decorated rooms and suites, all with balcony or terrace. Most appreciated are the exquisite breakfast with Belgian delicacies, the quietness at 10 minutes walking from the beach and boutiques, and the kindness of our experienced team, always ready to fulfil your wishes. Hotel surroundings – This neighborhood is a great choice for travelers interested in luxury brand shopping, clothes shopping and shopping – Check location Excellent location – show map Guests loved walking around the neighborhood! House Rules Hotel Manoir du Dragon takes special requests – add in the next step! Hotel Manoir du Dragon accepts these cards and reserves the right to temporarily hold an amount prior to arrival. Breakfast should start earlier. Only from 0815 hours is little bit late.